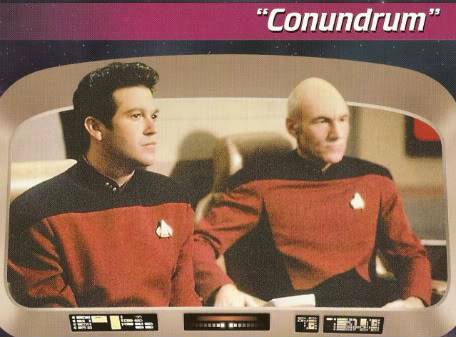 What is a Conundrum? According to the dictionary, it's a riddle, an intricate problem or a mystery. Yes, all three descriptions sort of fit this episode. This story uses the amnesia angle - a commonly popular ploy used in many TV series; it's very innovative here. 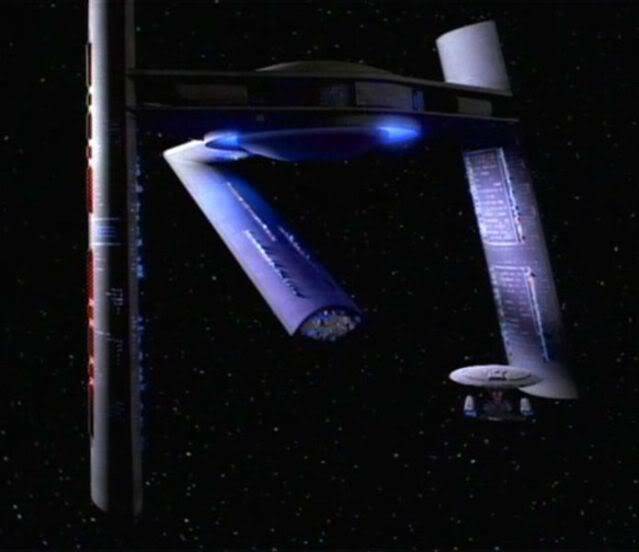 The Enterprise is approached by a small ship which implements some kind of scan of the starship. Next thing we know, everyone on the Enterprise loses their memory. They retain their knowledge of how to work the systems of their ship but have no memory of their own names, let alone what their objectives are. 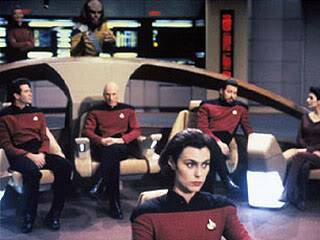 They also are unaware of what the current rank structure is on the bridge; this leads to a brief benign power struggle as warrior Worf automatically assumes that he is the lead officer, while Picard is less aggressive in determining who should command. But, the most intriguing bit of mystery involves the casual introduction of a new first officer, MacDuff (Erich Anderson). 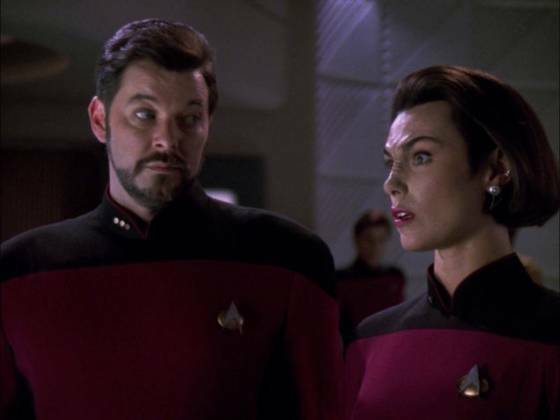 In this new command structure, Riker is now 2nd officer. Huh? I remember when I first saw this episode, I was really intrigued by the turns of plot as the episode progressed; there were new questions raised every few minutes and not many answers, but this continuing mystery kept me at the edge of my seat all through to the end of the episode. I liked the style here, too; the way MacDuff was introduced, for example, was not dramatic - in fact, it was anti-dramatic, as if he really was first officer aboard the Enterprise and the crew were just forgetting this fact. Then things start to get really interesting as a possible romantic connection is developed for Riker and Ro (in her 3rd appearance). 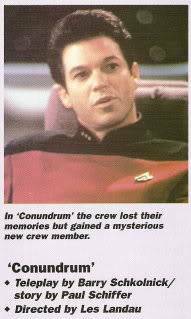 Just before the mind wipe, it was established that there was tension between Ro and her commanding officer, Riker; he saw her as difficult and willful. But now, it looks like their tense relationship was just a result of a hidden, repressed attraction. One can imagine how all this will end up after their memories are restored, including the involvement of Troi, Riker's former flame. 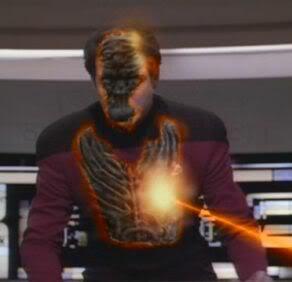 Oh, and, I guess Guinan was not on board during this incident; she would have probably been immune to the memory wipe. Things do become pretty grim as the episode proceeds. 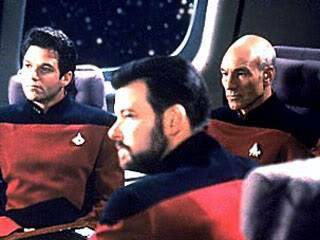 The crew are made to think that they are on a warship, in the middle of a years-long war (this recalls the alternate reality in Yesterday's Enterprise). They also believe themselves to be victims of their enemies' latest weapon - the reason their memories are gone. Operating in the dark, they don't have much choice except to proceed on the available information, into enemy territory, and to perhaps end the supposed war. This results in tragic casualties which Picard will have to live with. 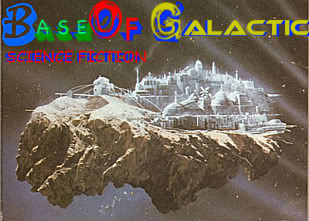 The machinations of the real foe are a bit too perfect - just the right computer records are deleted/maintained and the technology for wiping away selective long-term memories seems unlikely, given that the Enterprise's weaponry is so much more superior. But, quibbles aside, this is an absorbing, entertaining episode.